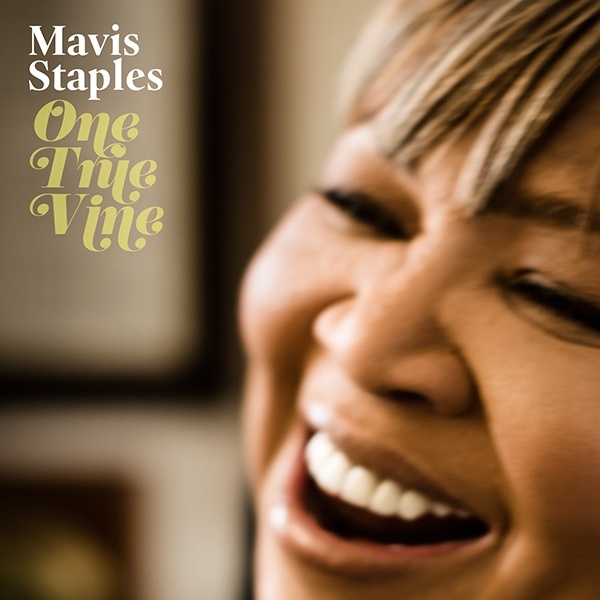 Mavis Staples Keeps The Faith On "One True Vine"
Like many other soul artists in recent years, Mavis Staples' career has found new life in the midst of the soul revivalist movement. Her previous album with Jeff Tweedy, You Are Not Alone, came out when the movement was still on the rise, a few Daptone record releases away from its zenith. In contrast, Staples' newest effort, One True Vine, is being released nearer the movement's nadir, at a time when slews of revivalism albums are being released just for revivalism's sake. To stand out as genuine and thoughtful in the midst of such opportunism is no small feat but one that Staples manages to do with tremendous grace and ease by doing what's been coming naturally to her for over 50 years -- singing about the Lord. With Chicago artist Jeff Tweedy handling production, One True Vine is a modern gospel album with the power to coerce even the strictest of non-believers into the cradle of Staples' approachable spirituality. The songs stretch thematically from religious restlessness to ardent faith and Staples sings each emotion in between convincingly, assuring listeners that she's experienced it all en route to salvation. The album's tracks unfurl much like the experiences of searching for faith do, starting first with a song that acknowledges the presence of some... thing, or as the track puts it, some "holy ghost" that, "feeds my passion for transcendence." Penned by Alan Sparhawk from Low, the downtempo song features sparse instrumentation and Staple's earnest voice brooding over what she feels but cannot see. Her solemn search continues on the slightly more ominous "Every Step" which is layered in harsh sound effects that remind the listener of the darkness that often accompany questing for salvation and is evident on other spiritual staples such as, "Wade in the Water," or "Nobody Knows the Trouble I've Seen." On the third track, the listener is offered a brief respite from the sudbued introductory tracks with a folksy reduction of Funkadelic's classic "Can You Get to That." The syrup-soaked vocals of the backup bass singer playfully challenge the listener to "get to that" in the spiritual sense. A perfect cover pick given the album's themes, the uplifting and assured tune ushers in a back half of songs that begin after the Tweedy original "Jesus Wept" and reflect a growing spiritual confidence. At the center of this less spiritually ambivalent back half are three gospel tracks that are so old they are technically considered public domain:"What Are They Doing in Heaven," "Woke Up This Morning (With My Mind On Jesus)" and "Sow Good Seeds." While all three tracks are appropriately modernized and intelligently arranged, Staples sings strongest on "Sow Good Seeds" where her hoarse and husky voice sounds as if its being projected into the moment from the past -- an effect that can also be attributed to Tweedy's slinking slide guitar that is reminiscent of gospel artist Blind Willie Johnson's style of play. Flanked between the gospel tracks and serving a similar purpose as "Can You Get To That" on the first half, is a funky reworking of the Staple Singers original "I Like the Things About Me." The cover features a plunking bass line and buzzing feedback -- elements similar to those found on the rock soul collaborations between the Black Keys and Dr. John -- and gives edge to Staples' forever endearing demeanor. Despite the more upbeat tones that dominate the second half, the album retreats back into a slow burn for the elegant closer, "One True Vine," a song whose title is lifted directly from the gospel of John. Acting as the response to the title track's call to find whatever it is that Staples can feel but not see, the "true vine" grants Staples salvation and allows her to feel, "set free from this mighty, mighty fire." Throughout the song, Staples' weathered voice aches, moans, and commands the listener's attention. Never before has she sounded so earnest and intimate and for that, and for everything else that One True Vine accomplishes, we should give thanks. Stream One True Vine here.